Think about the British Invasion and who comes to mind? That’s right, The Who come to mind! As do the Beatles, the Rolling Stones, the Kinks, the Yardbirds and the Animals. Those groups were at the core of the movement; they’re the ones that, for the most part, still get the attention today. But they alone did not an invasion make. Many other artists from across the Atlantic made their presence known in the United States and elsewhere, and some of their many hits still excite when they come pouring out of a pair of speakers (or ear buds, or whatever). Time and changing musical taste has relegated some of these hits to the far corners of our collective memories, hence the “lost” designation in the headline. For us though, they never went away! 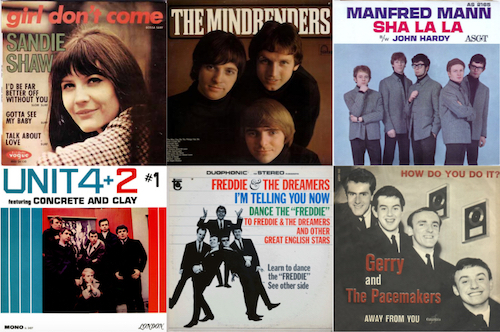 Here we look back at a dozen British Invasion hits that we still adore, even if they’re not by artists that were Rock and Roll Hall of Fame shoo-ins. And we’ll be back with another volume soon, so if you don’t see your favorites here (hello DC5, Hermits, Dusty and Hollies, and you too, Hullabaloos! ), keep checking in at Best Classic Bands. Relatively few women arose during the British Invasion (Dusty Springfield, Lulu, Cilla Black and Petula Clark were among the exceptions), and although the former Sandra Goodrich couldn’t maintain her status as a charting artist in the U.S. (she remained popular in the U.K. for some time), she did place five singles on the Billboard Hot 100, of which this gem, which peaked at #42 in 1965, was the biggest. Written by Chris Andrews, it lilts along at a bossa nova-like pace offset by dynamic crescendos, Shaw delivering—in a compelling style—her sad tale of the agony of being stood up on a date. Among her most ardent fans was Morrissey of the Smiths, who produced a comeback hit for her in the ’80s. This band went through a few distinct periods marked by its three top 10 hits: “Do Wah Diddy Diddy” (1964, #1), “Mighty Quinn (Quinn the Eskimo)” (1968, #10) and a cover of Bruce Springsteen’s “Blinded by the Light” (1976, #1). But this little gem is also worth a revisit. Just as they’d covered the Exciters with “Do Wah Diddy Diddy,” the Brits nicked this one from girl group faves the Shirelles, who’d had a minor hit with it earlier in ’64. With Paul Jones delivering a soulful vocal (Manfred Mann himself was the keyboardist), the song rocked its way to #12 and ensured they would not be a one-hit wonder. The former Terence Nelhams-Wright already had fame in the U.K. as an actor and pre-Beatles pop star when he recorded this side in ’65. It wasn’t even released in his homeland but in the U.S. it climbed to #31. It starts out slow and cool, a bluesy harmonica whiling the time away in response to Faith’s lazy vocal, and then Faith wakes up and rocks the hell out of it. Really, really rocks the hell out of it! Bob Henrit and Russ Ballard, two members of his backing band, the Roulettes, would soon join Unit 4 + 2 and later Argent. Favorite line in the song: “I really, really love you a lot, dear, really love you, so what dear, if you want me it’s alright.” Faith passed away in 2003. We first heard them in the spring of 1965 as Wayne Fontana’s backing group on the #1 stomper “Game of Love.” A bit of silence ensued after that and then, a year later, here they were again, with no Wayne Fontana in sight. “A Groovy Kind of Love,” as its title suggests, was a gentler song penned by Carole Bayer Sager and Toni Wine, rich in harmonies and a groovy lead guitar solo by one Eric Stewart, who would resurface in the early ’70s with future Mindbender and ace songwriter Graham Gouldman as the movers and shakers behind 10cc. “A Groovy Kind of Love” just missed the top spot, settling at #2 in the spring of ’66. No worries though: 22 years later Phil Collins took his version to #1. How great was this band? Had it not been for some other fellows in the neighborhood, The Searchers might very well have gone down in history as Liverpool’s most successful group of the ’60s. As it is they managed to 14 singles on the Billboard chart between 1964-71, among them “Needles and Pins” and “Love Potion No. 9,” but this cover of Malvina Reynolds’ folk song—originally written as a protest against nuclear testing—was one of their most beautiful. The rich vocal harmonies and chiming guitars give it a simultaneously mournful and seductive feel, and although it peaked at #29 in 1965, it retains all of its power and glory today. From Birmingham, England, the Fortunes managed to place six tunes on the American charts into 1971, but their first, from ’65, is the keeper. Sung in close three-part harmony until nearly the end, when a lone voice cries out in pain, the tale of lost love was written by Roger Greenaway and Roger Cook. Considering the tragedy at hand, the peppy folk-rock-ish arrangement by Les Reed may not seem appropriate yet it works like a charm. The first two things that usually come to mind when this 1964 #5 hit is mentioned are A) They had a female drummer, Honey Lantree, which was quite unusual at the time, and B) They were produced by Joe Meek, often called the “British Phil Spector.” Meek’s greatest success had come in 1962 with the Tornados’ instrumental “Telstar,” but it all ended badly for him in 1967 when he murdered his landlady and then took his own life. All of that aside, “Have I the Right?” is a non-stop stomper that still sounds great today. Having already scored a #1 smash with their Lennon and McCartney-penned breakout “A World Without Love,” as well as several other tunes, Peter Asher and Gordon Waller took on this lush ballad in 1966 written by Bernard Webb. Except that there was no Bernard Webb. That was a pseudonym used by Paul McCartney, who was dating Peter’s sister Jane Asher at the time. McCartney wanted to see if one of his songs could be a hit if it didn’t have his name attached to it. He needn’t have worried: it reached #14 in the U.S. As for Peter Asher, he went on to become one of the most successful producer/managers of the rock era, with clients including Linda Ronstadt and James Taylor. Gordon passed away in 2009. They’re mostly remembered—when they’re remembered at all—for the silly dance the singer and band members all did while playing: The Freddie. It basically involved kicking one leg off to the side and then the other, in unison. They even had a top 20 hit called “Do the Freddie.” But their debut, which reached #1 in early 1965, is what put the bespectacled Freddie Garrity and friends on the map. Penned by the singer and Mitch Murray, it was a harmless, giddy, uptempo little love ditty like so many others, but charming enough that it caught on in a big way. Sadly, Freddie Garrity died in 2006. They began as Unit 4, a quartet comprising musicians who would never be heard from again after enjoying their initial flush of fame. But the +2 were another story. Russ Ballard and Bob Henrit—who would later enjoy a much higher profile as co-founders of the band Argent—were session players who were hired to aid the band, hence their new name. Group co-founders Tommy Moeller and Brian Parker co-penned “Concrete and Clay,” which, with its “love will never die” sentiment and Caribbean rumba-esque rhythm, caught the ears of both British and American listeners. It hit #1 at home and only rose to #28 in the U.S. (where it split sales with a version by Eddie Rambeau, which reached #35), but that was enough to cement Unit 4 +2’s place as permanent members of the honored British Invasion club. Yes, they were all hits, which is why the article is called “Lost Hits” and not “Lost Songs.” But many people have forgotten about them or never heard them. You’re lucky to still remember them all. I’ve heard the 4+2 song on the radio a few times during my youth……..had no clue of the name of the song, name of the group, nor the connection with Argent. Thanks for posting this bit of info…. Unit 4 + 2—“Concrete and Clay” is the only one I don’t know. Of course, I’m older than dirt! To me the British Invasion was one of the best times in rock music. Each week Ed Sullivan introduced a new act from Britain with such groups as The Beatles,Gerry & The Pacemakers, Peter and Gordon, Chad and Jeremy, The Dave Ckark Five, The Searchers…. the list goes on and on. I still enjoy many of these songs on a daily basis and glad I was a teen at the time being exposed to such great music. Thanks for the article, Jeff. I agree that most were hits “It’s Alright” ??? But every other song I remember clearly. It’s fun looking at these songs, and yes, I consider songs like My Generation and You Really Got Me first when thinking about the British Invasion. An excellent Monday morning read.